An aggressive kid – can cause a lot of family tension and drama constantly making unreasonable demands of his parents and family members and can be the source of much angst. In our Monday Morning LIVE we discussed how aggressive kids and teens throw tantrums and hold parents to ransom. A mother who has come to me for help is struggling with her teenage daughter who has temper tantrums when her demands have not been met. 👎This teen wears inappropriate clothing. 👎This teen is spending ridiculous amounts of money shopping. 👎This teen’s behaviour is off the charts. 👎This teen is being highly aggressive and volatile. 😨 The parents are feeling helpless, frustrated and completely disempowered not knowing how to handle their child. In the LIVE I share stories of other parents who when ‘over-indulging’ and ‘pampering’ their children are actually doing their kids a disservice. Sometimes parents themselves do not have the emotional stamina (or time or patience) to manage their child’s tantrums and therefore find it easier to give in to the vicious cycle of acquiescing to their every demand in the short term so as to avoid dealing with the strain. Parents need to try to get to the root cause of your aggressive child’s demand – is it your attention they crave? or is your kid struggling with their own self-esteem issues? Is your kid getting your positive attention or creating drama and tantrums to get your attention even if it is negative? 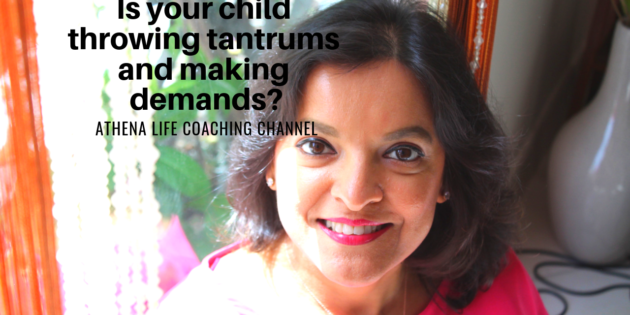 If you have a child or teenager who is always throwing tantrums to get you to fulfil their unreasonable demands and you are feeling exhausted and helpless then click this link to fill the form to book a FREE call with me.